One reader has called this study, first published in 1984, ‘easily the best book on the relation of Hegel to Marx’. With spirited argument, MacGregor demonstrates that Hegelian logic suited Marx’s purpose so well because it already contained the unique elements that later appeared in Marx’s social theory, including the notions of surplus value and the transition to communism. The most exciting thing about the book is the clear demonstration that the mature Marx gets ever closer to Hegel, and is increasingly indebted to him. In short, the author gives us a new Hegel and a new Marx. In a manner both original and penetrating, MacGregor shows that dialectical logic is pre-eminently social logic, a reconstruction in thought of social relationships and social structure. Central to the work is the examination of the Philosophy of Right, in which Hegel delineated a theory of modern capitalist society. MacGregor provides a compelling analysis of Hegel’s importance for Lenin and a strong caveat that contemporary Marxism ignores Hegel to its own peril. 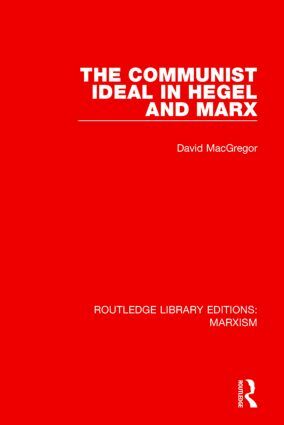 MacGregor establishes that Hegel’s absolute idealism is founded on a theory of the dialectics of labour similar to Marx’s historical materialism. Another significant discovery elucidates Hegel’s concept of poverty as the missing link which joins Marx’s formulation to classical liberal theory.